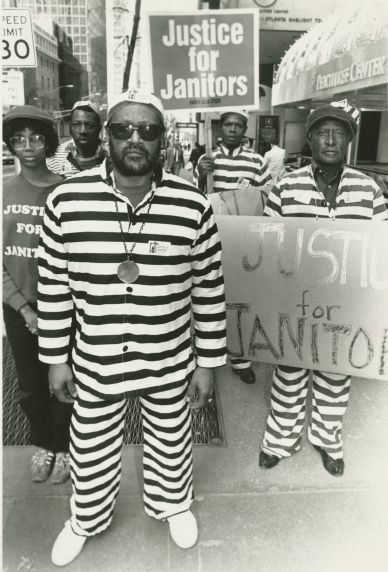 A demonstration by SEIU members for the Justice for Janitors campaign against the Peachtree Center of Atlanta, 1988. In the center wearing sunglasses is professional wrestler James “Thunderbolt” Patterson. Known for once holding the US title and trying to create a labor union of professional wrestlers, James took time off from the activity to be an organizer for SEIU and became a prominent member of the J4J Atlanta campaign.